Dancing Dog Cabin: Does Your Dog Love Peanut Butter? I've yet to meet a dog that doesn't love peanut butter, and mine are no exception-- they take after their mommy! I'll bet yours are just the same as mine-- as soon as the peanut butter jar comes out, they're right there, ears pricked, looking hopefully up at you with big, doleful eyes. I like to make doggy treats, since that's one way of ensuring that my babies get a healthy treat that doesn't have a lot of outlandish and questionable ingredients. 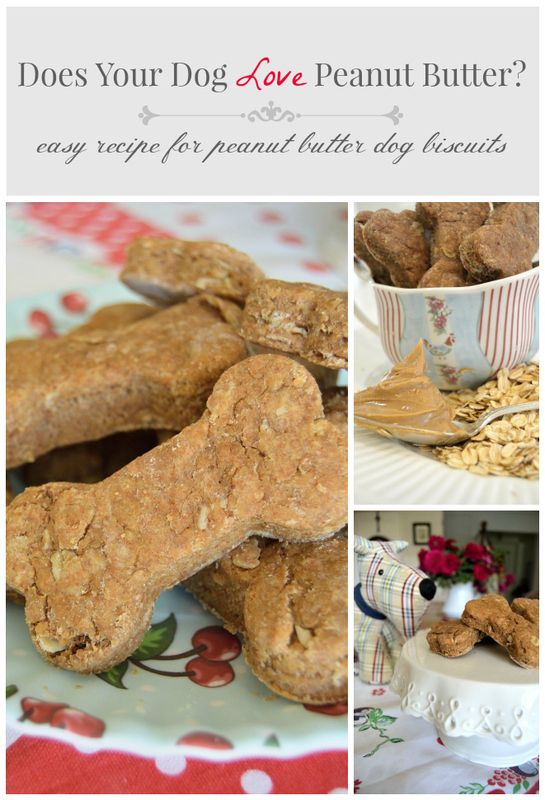 There are plenty of doggy treat recipes out there, including many with peanut butter as the starring ingredient.... irresistible for dogs who love peanut butter! You can have a lot of fun making all kinds of uniquely shaped dog treats-- dinosaurs, little -'peanut butter' men (as opposed to gingerbread men), Halloween characters, Christmas characters....there is no lack of variety when it comes to cookie cutters. I used a simple dog bone shape here to create a classic dog-bone shaped treat, using a dog-biscuit recipe that is an adaptation of several different recipes I found online. .....as well as some pretty retro-themed napkins that I found in one of my fabric bins (I have enough decorator fabric on hand to start a yardage store, but that can be a future post....). But in the end she couldn't resist and inched closer and closer to the pile of treats (she'd already had a sample earlier, so she knew what these little guys were), until she was close enough to nab one! My Rosie-Bear is a little camera shy.... she totally ignored the plate of doggy biscuits. On to the recipe.....This is an easy recipe with simple, wholesome ingredients, which include, in addition to peanut butter, oats, wheat flower and a broth (chicken or beef). I used old fashioned oatmeal for a rustic, robust-looking texture (not that dogs care about texture). Since my dogs are big girls, I used a three-inch dog bone cookie cutter. If you have a small dog, use a smaller cookie cutter or use a knife to cut the rolled dough into small bite-sized pieces. This recipe makes a nice, stiff dough that holds its shape and doesn't spread in the oven-- probably because there is no butter or shortening. I actually sampled a small piece and they don't taste too bad from a human standpoint, although they have an odd, flat after-taste (probably from the lack of any shortening and the peanut butter-chicken broth mixture). But my dogs love these things, so that is all that matters! After rolling out the dough and cutting the cookie shapes, you can gather up the remaining dough, roll it out again, and cut out some more biscuits. Gather up the last remaining pieces and roll into a rough cylinder and cut little bite-sized treats. This is one time when you don't need to worry about over working the dough and creating tough cookies----as I note above, dogs don't seem to concern themselves too much with texture. In a large bowl, combine the dry ingredients. Stir in the broth and peanut butter until the flour mixture is incorporated and the dough is crumbly. Using your hands, form a ball. Kneed the dough for about 30 seconds on a lightly floured work surface until the dough holds together. Roll the dough into a 10-inch circle, at about 1/2 inch thick. Using a cookie cutter, cut out the 'bones' and place on the prepared cookie sheet. Gather up the remaining scraps and form another ball, which can then be rolled out for more cookies. Or, roll the remaining dough into a cylinder shape and cut little bite-sized treats. Bake until golden, about 20 minutes. Bake a few minutes longer for more crispy treats. Transfer to a wire rack and cool completely. These doggy biscuits can be stored in an airtight container for up to one week--- but your doggies will want to gobble these up long before then! My boys(dogs) love peanut butter....I can not wait to bake these for them, I am sure they will love them! Pinning! We would love for you to share with us at Party in Your PJs, our weekly link party. Yes, I'm pretty sure your dogs will love these treats. My dogs certainly do! Thanks for inviting me to join Party in Your PJs. OMG! I made these on Saturday for my boys and they LOVED them. AND, I loved making them for them, so much so, that I blogged about them. I directed people to your blog to get the recipe, I hope you don't mind. Thank you again, and Lupin and Tyson send you doggy kisses too! Wow, thanks so much! I'm glad you and Lupin and Tyson had fun making and eating (the dogs) these treats. Bailey will eat pb snacks, but could care less for it straight out of the jar. I need to make her some of these. I'm sure Bailey will love these treats. Thanks for visiting! Uh oh...we didn't get to have this post on OUR party? This will not do! 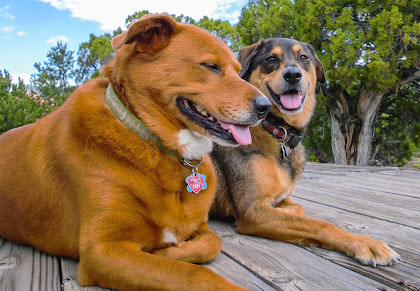 You are hereby invited to come right over to share this adorable doggie post. Wonderful Wednesday Blog Hop on Ducks 'n a Row! I pinned this twice so I won't lose the recipe. My yellow lab, Sadie, will love them! Sinea, thanks for telling me about Wonderful Wednesday and inviting me to link up! I'm sure Sadie will love these treats. Our Neena would LOVE these treats...I'll have to make them for her! LOVED the photo shoot with your two cuties!! OMGosh I love the adorable pictures of your puppy stalking the plate of yummy treats! I know our Buster who is a big boy at 100lbs would LOVE these doggie delights. Going to have to make these for my baby. Thank you so much for sharing at SYS this week and have a wonderful weekend! Thank you Barbara! I hope you and Buster have a great weekend. Thank you for sharing on Idea Box link party! LOL! How cute! The same thing happens in my kitchen every time the peanut butter jar comes out. Thank you Debra! I'm glad you had fun reading this post-- it was a lot of fun to put together! Thank you Mila! Thank you for featuring my post on the Idea Box-- I truly appreciate it! What a lovely blog you have! Beautiful, heartwarming photos! We are a family of dog/cat rescuers so I pinned your recipe for a later time when the grandkids are ready to sell dog treats at their lemonade stand during neighborhood garage sales - proceeds to the rescues their pets came from. Thank you! Thank you! Making and selling dog treats and then using the proceeds to help rescue pets is a totally wonderful idea. I'm glad that you will be able to use the information in my post to help animals in need. Different breeds have different taste and different choice; never before I have seen my dog eating peanut butter; but he loves to eat other foods. I love to try peanut; we have found same thing with human as we found with animals that is normally we called eating disorder. We human beings are loves to eat what we loves to have same thing also with animals; they are not eat whatever we offer; they eat only those what they loves to eat. I wish I could have try peanut for my dog but wondering my dogs loves it. Thank you, once again, for a terrific, easy to make recipe! Your readers might want to know that it works well in silicone molds designed for baking, too. Just press in the dough to 1/2" thickness. They pop out perfectly and look great! Thanks for the tip. I'll definitely be giving the pay print molds a try-- what a great idea!